subroutine Install a card from Archives (paying its install cost). Crick is a new monster adding to the current Meta-giant Replicating Perfection's bag of tricks. Single handedly it can protect archives threatening to bring back expensive assets, or difficult to deal with upgrades. The standard breaker suite doesn't deal with Crick on archives effeciently. Passport and Gordian Blade both pay 5 to break this 1 ice. Even Datasucker can only lower the price by 1 if you want to a datasucker counter to stay. D4v1d is the only breaker that breaks this with ease. Considering the lack of targets for D4v1d in most jinteki decks, this will not tax your precious counters like in other matchs. Even when you put this on a server other than archives, it's not a bad piece of ice. There it acts like a datasuckerable pup. On average it will cost 1-2 which it perfectly fine. 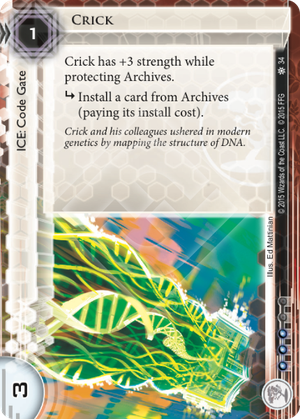 Crick is good in all Jinteki decks that run assets and upgrades. Being able to recur destroyed ice is a fringe bonus. Right now I wouldn't consider running less than 2 in a Jinteki deck, esp if that deck was Jinteki: Replicating Perfection.